To prevent the rest of the forum from getting cluttered. Resetting game doesn't lock dungeons until you also refresh. 1 factory after refreshing is enough to enter the dungeon. Bad spawning, both for you, monsters, and bosses. Your girl-scout changes to Chip upon going down a floor. After finishing a floor, the game sometimes freezes until you click an arrow button. Autopilot doesn't always kick in, I believe this bug only happens if you start floor 1 with Doe. Pathfinding is terrible and will often get stuck. Chip isn't invincible for me, I think that her stats depend on how many factories you have, so if you have a lot of factories she might be invincible. The automatic controls seem to switch on whenever you don't press a button for a very short amount of time. Many aspects of the dungeons don't seem to work at all if your resolution isn't set high enough. The text blocks the arrows, and the keyboard arrow keys only affect the scrollbars. But if I set my resolution too high, everything becomes too small to see or read. So, I'm boned because my monitor's too small? It would definitely help to have some way to bring the dungeon into a different frame. Having the dungeon in a different window would be nice if possible. Would be nice if dungeon exploration didn't start automatically unless you set it to. A different window would be annoying. Dungeons and other minigames should he make more should have their own individual tabs. I can't seem to be able to use my keyboard controls. Where am I supposed to be clicking to enable this? I don't know if it's just me, but after I bought my first cursor [15 cookies], the second cursor wasn't available to purchase at the listed 17 cookies [had to get 18]. Only just started, gonna see if anything else is weird! I'm being unable to use the arrow keys to control my scout for some reason. My browser is Firefox 23.0.1 and I use Windows 7 Home Premium. This is probably the rounding bug again... I'm surprised it would affect a small number like that. I got 50 factories then the game froze. I saved then reloaded, but now I can't access it anymore. I don't even know what the dungeons look like! I also can't use arrows for the dungeons. 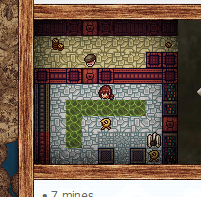 The dungeons background image seems to change when I hover over it/move the mouse away. why girlscout autopilot so bad? She dont fight with small mobs, rush for boss, whe he stand near boss, girl fight not with boss. And not get back when hp is low. I am using firefox and also cannot use keyboard movement. The autopilot isn't very good- the girlscout will sometimes get stuck, and sometimes even move two spaces at once? Also, the girlscout ignores dropped cookies. The cookies gained from the dungeon are far too low considering the cookie income required to get 50 factories, and don't appear to increase in quantity much relative to how far down you go. My girlscout was Lucky first, then changed to Chip upon entering the next level of the dungeon, and stayed as Chip from then on. With my browser size, the text takes up the same space the girlscout/enemy are in, which isn't that bad actually, but it would be better if it had its own tab like the Update/Menu/Stats, so more vertical space could be used instead of horizontal. Speaking of which, normally you can't see the grandmas very well behind everything. Could there be a tab that displays nothing? Just, a way to turn off the building displays? Elder Covenant is still displaying the wrong cost; now it's 66,666,666,666,665. As WhattayaBrian suggested, it's probably fighting floating numbers the wrong way. Iunno, maybe this is all you need to do? On a side note, I've always used addCommas to handle commas. Yeah, I just came back to find my girlscout stuck. And with all the other issues, my only way to fix it was to go into my settings and change my screen resolution, making everything tiny for long enough to get her out of that corner - which was incredibly difficult, by the way, as she kept trying to run back into it while I was in the middle of clicking the arrows to get her out. I think the autopilot is supposed to be kind of bad, so that there's a point to playing manually. She shouldn't get stuck though. rooms should have less water/non-destructable obstacles for heroes to not get stuck or improve AI pathing. Tested with Google Chrome yesterday to check if it was a Firefox thing and still couldn't use the keyboard to pilot the scouts. No arrow keys, no WASD, nothing. And Chrome also had that background problem dealio here. I'm not even going to test it with Internet Explorer. So I just refreshed my page, and now there is no autopilot. This is also the first time I've had a girl besides Chip (I have Doe) right now. The arrow keys still don't work, I have to use the buttons. I'm using Chrome on Windows. When I first get to a new level, it doesn't focus on Chip, but somewhere else in the new level until I press one of the buttons. The text log also disappears temporarily. Edit: When I start with Doe, autopilot seems to move 3 times, slowly, and then stop. This only happens with Doe, but autopilot stays off when she switches to Chip after going down a level. Things get stuck in inaccessible places. Chip, the girl scout, and a worker, have been moving in the same place for more than 1 hour, maybe two. I'm almost sure that it has something to do with those two characters and their position. I think that they won't stop if I don't move "Chip" manually. Note: In lvl. 60 I didn't move "Chip" before she was "struggling". - I moved Chip up some spaces and after some weird A.I. movements she and the worker fighted to death, Chip ended victorious. - After the fight, she's back moving in the same three spaces as before. - I moved her again far away from the place were she was "stuck" and now she is moving as before in a set of four spaces. - Again, I proceed to move her but now much farther (Having a hard time with automatic movements) and now she is "stuck" in another set of three spaces. - I moved her again and also this time she is struggling to get some enemies separated by two walls (the two yellow creatures that can be seen in the first pircture), in the same place as the beggining. Maybe the worker wasn't the only problem. Thanks for the reports so far, guys. You may be interested in this temporary fix. Enemies and/or other things can be blocked by the boss in a narrow enough room, preventing a 100% completion of a level. I have some information on the keyboard not working for dungeons in Firefox: The keyboard actually DOES work, the only problem is that clicking on the dungeon doesn't put the dungeon into Firefox' focus, therefore using the arrow keys and space just scrolls the page. There is, however, a workaround: You can manually put the focus onto the dungeon by pressing TAB key until a box appears around the dungeon's event message. Once the box is there you can use the arrow keys and space to navigate through the dungeon. I am either in the wrong forum, or just way behind everyone else here... anyway.. the golden cookie special that is supposed to be x7 for 77 seconds only worked on the cps and not on any manual clicks, I am in chrome. Importing from live to beta gives +2% CpS per heavenly chip, haven't played too much of beta, so don't know if it's supposed to give 2% or 1%. Nevermind that, tooltip needs to be updated. That's intentional. It will only affect your clicks if you have the upgrades that give you a percentage of CpS from clicking. Having a temporarily higher CpS will then give you a temporarily higher bonus from those upgrades, but your flat cookie click numbers aren't affected. And anyway, are you talking about the beta test of the next update, or the normal Cookie Clicker game with the current version? If it's the latter, that's not considered "beta" and goes elsewhere in this forum. I'm not sure if this is a bug with the game itself or the temporary fix script, but whenever I'm Doe the autopilot doesn't work.